Housing choices in all types of communities vary widely. You will find town homes, garden apartments, condos, single family homes, high rise apartments, and more. Prices for homes range from under $20,000 for a used home in an RV/Manufactured community to millions of dollars in pricier developments. Home Owner Association (HOA) fees do the same thing – some communities offer great services for very little cost, and other times you pay top dollar for perfect landscaping and extensive staff. You have to do your research to find out. All ages. To give you an idea of the size of this universe, over 1300 of the 3800 communities listed at Topretirements are classified as All-Age. There is no minimum age requirement to live there. But most of the residents in these communities are probably 50 years or older because of the amenities they offer and where they are located. Fearrington Village near Chapel Hill is a good example: it is open to all ages, has many retirees, and even has a CCRC on the campus. The advantage of an all ages community is that you will be living among at least some people who are younger than you are. The downside is that if you are you over being around children and teenagers on a daily basis, this won’t be for you. 55+ communities. In these developments at least one of the residents has to be at least 55 (sometimes 50 or 60) years old to live there. Children are generally not permitted to live there permanently. There are 2400 of these in the Topretirements.com database. Most of these 55+ communities would also qualify as active adult communities if they have enough amenities. 55 Communities within larger developments. An interesting hybrid possibility is a community where there are 55+ plus neighborhoods within an “all-age” community . Cresswind Victoria Gardens, located within the all ages community of Victoria Park in Deland, FL, is an example. In these cases some of the amenities are shared while others are exclusively for one group or another. Active adult communities. This is more of a marketing term than some official designation. Any community can call itself active adult, which to our thinking, sure sounds better than retirement community. The “adult” part of the name implies that there is an age restriction involved (55+ is usually the minimum but that is not always the case). The word “active” is very important in the description. It implies that there are active things to do there – like a swimming pool, clubhouse, golf course, walking trails, marina, etc. Some people liken them to summer camps for retirees, you can keep busy from dawn to midnight. 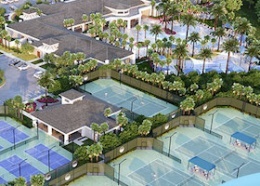 The majority of the communities profiled on this site are considered active adult because they have at least some kind of minimum amenity (without amenities they would merely be 55+). They range in size from a few dozen units to communities with over 100,000 residents. 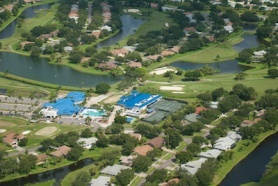 Valencia Bonita in Bonita Springs, FL is an example of a large active adult community with extensive amenities. The advantage of living in an active adult community is that there is always plenty to do right where you live, and the costs are shared with your neighbors. You can walk across the street to the pool, golf course, or pickleball. Join a club, or take an exercise class, etc. in the clubhouse. The disadvantage is that if you are not active, or can make your own fun, your HOA fees are going to support the amenities you don’t use. In some communities things like golf fees are optional, in other cases everything is bundled in together. Speciality communities. Feel like all retirement communities are the same, or that there won’t be one that fits your specific needs? At Topretirements you can use Search to find communities dedicated to Cohousing/cooperative, occupational (including former military), ethnic, religious, pocket neighborhoods, LGBT, and New Urban. 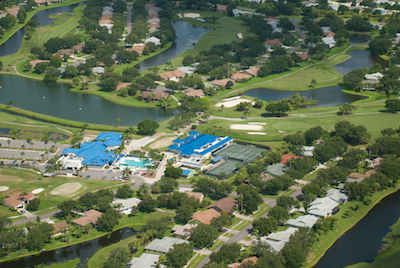 Indian River Colony Club in Melbourne, FL is an active adult community aimed at former military personnel. RV/Manufactured Home Communities. 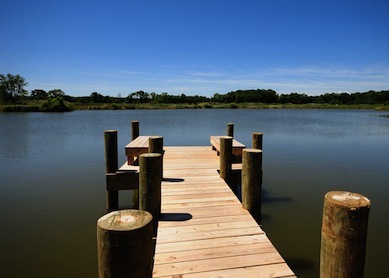 Located throughout the country, but particularly in warmer parts, these communities offer flexibility and affordability. In some you can either rent a space for your RV or rent a small home of some type. Some communities are basically trailers, while in others there are very nice manufactured homes. Prices, even on new homes, are usually low, sometimes well below $100,000. They all tend to have at least a clubhouse and outdoor swimming pool. 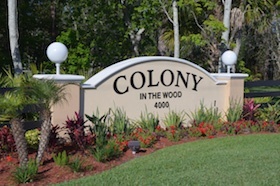 Colony in the Wood in Port Orange, Florida is a very nice manufactured home community with many amenities. The types of communities described so far are generally meant for retirees who are still active and above all, can live on their own. People who are in the early stages of retirement generally choose one of those, if they are going to retire to a development. But for older people, those who are starting to lose some functioning, or someone who is worried about the future, there are other choices. Some of these communities offer a variety of living options (like assisted living and independent living), while others are focused on one type. Independent living. The implication here is that you are capable of living on your own in your own apartment or home. But there are probably some communal facilities, such as group dining options and some staff support. If you need more help, you would have to hire it yourself. Assisted living. This means that you need some help in daily living. There is either a dining room for meals or they are brought to you. Aides check on you and provide a range of personal services, as needed, such as bathing and dressing. Nursing homes are the ultimate example of assisted living. Continuing Care Retirement Communities. CCRCs, also called Life Care Communities, are a hybrid of independent living, assisted living, and nursing care. They are definitely the smartest long term choice for retirees who can afford them; the question is usually when is the right time to enter one. They usually have age restrictions and in fact most residents in these communities are at least in their 60s. The attraction of a CCRC is that if you can afford one and qualify (there is a physical) you are set for life. You will live in your own apartment or home, but as your life changes you can move to assisted living or the nursing care section. If your partner gets sick and enters assisted living, you can stay in independent living until they either get better or not. Most CCRCs have fabulous facilities and amenities like indoor pools, gyms, activity directors, clubs, lifetime learning, executive chefs, and more. They are not inexpensive though. And if you wait too long to try to join one, a health condition like Alzheimer’s might mean you get rejected. 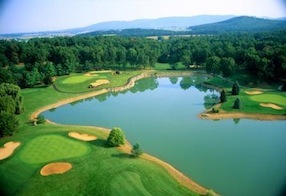 Brandermill Woods in Midlothian, VA is a community offering a continuum of care. When to get started – and what to look for. Finding the right kind of community takes time and effort. Much will depend on your budget, interests, and personal preferences. Our recommendation is that you get started early, at least 5-10 years before your planned retirement date. Check out communities where you live now, and in other parts of the country you might be considering. Use your vacations, visits to friends, and business trips to check some off. The more you see and the more you explore, the more you will be able to narrow and refine your search. In the next module we will cover how to choose a community to visit, and how to make the most of those visits. Discuss with your partner, close friend, or family member what kind of community appeals to you, and why. List the areas of the country you are interested in, and discuss the activities you want to pursue. Find out what you share in common, and where you might need more discussion. Here is where you can see 50 State Community Directories plus those in many foreign countries. Use Advanced Search to browse by State, type of community, amenities, etc. Module 5: Overcoming Loneliness in Retirement? Now this was an eye-opener, our plan has been to go to an active adult community with all the amenities and then to a CCRC when needed. And so we have been looking at many nice communities each winter as we travel along the east coast to FL. But we had no idea that you need a physical and to be healthy to go to a continuing care community, does this mean even if you just want independent living and don’t see the need for assisted living for many years yet? We have a lot of discussing to do and may have to include some CCRCs . and we already will look forward to the next module of how to choose a community to visit! Would you please do an article on 55 plus communities within a larger non-age restricted master-planned community that also Contains a CCRC? These communities seem like the best of all worlds! Also is there a way to search for them on your site? Editor comment: Glad you found this useful. Fearrington Village is one all ages community we know of that has a CCRC on campus. We used our Advanced Search to find 248 communities that say they are CCRCs (not all might meet the exact qualifications). You can narrow that search to State and then explore to find out more. This is a very comprehensive article! I very much would like to live in a Manufactured Home Community; however, it is so hard to get much information about them. When I’ve contacted communities or those who deal with such issues, I either get no response or a one-sentence reply. Any additional info. and names of good resource sources would be greatly appreciated! I see many mobile home communities in Florida. Could you do a story on living in one of these communities? Can you rent the mobile home or must you buy it? Typical home and ground rents? Do most people live in them all year or only in the cooler weather? How resistant to stormy Florida weather are the mobile homes? Must a person be technically oriented to deal with the various mechanical systems in a mobile home or can a lifelong apartment dweller figure it out? Might be a good line of inquiry for people looking to retire to Florida or just looking to rent a place for the Winter in Florida. Great article and perfect timing for us. My husband will retire this year and I’m retiring next year. We plan on moving to FL’s Gulf coast for the warmer climate but didn’t quite know where to begin due to the overwhelming info. on the web. So thank you for the great info.! In my area, Tucson, most of the 55+ or active adult communities, allow a percentage of residents to be as young as 40, some 45, some 50. Usually it is 10% who can be younger and still maintain the communities age restricted protections under the law – the protection is against age discrimination for not allowing under 19 as permanent residents in households. So, if these active adult communities interest you and you are not yet 55 you can very likely still purchase and live there…ask. Great article. I started looking for my retirement destination about 5 years before I retired in 2018. I was very surprised that I changed my mind about what I wanted 3-4 times. Each time, I was sure that my decision was final. I narrowed my retirement destination down to a few states (FL, SC, NC and PA). I researched cost of living, made spreadsheets with everything from cost of living to wishlist factors such as library, airport access and my favorite stores, and visited 55+ communities. At least 3 times during this period, I was certain I had picked my community. My kids talked me out of Choice #1 by showing me that medical care would be a problem in that area (they are medical professionals and researched the number of beds, specialists and ratings of the local hospital). After meeting with the developer of Choice #2, I learned that I couldn’t get my dream retirement home in that community. I was told I’d have to buy a home with their cheapest options and then rip everything out after purchase if I wanted anything oher than the developer’s options. That seemed wastefull Choice #3’s pricng started climibing out of my budget, including real estate tax increases. I finally decided on a community in the Hilton Head area after taking 3 weekend trips to look at the models and the area. I scheduled a buying trip 2-3 months before retirement. Checkbook in hand and towing one of my kids to help me with the purchase decision, we met with a realtor and the developer. It didn’t go well. The realtor chattered the whole time about how wonderful it was to be a widow in that community. She talked about the fact that her whole street was widows, and they went in & out of each other’s houses all day long. She raved about their joint dinners, group vacations, and more (I’m an introvert). The realtor described how quiet the community is in the summer when many people go North, and complained about the traffic from vacationers. She told me about her experiences handling hurricanes. As we drove up and down streets to look at resales, I noticed that all of the houses looked alike. The community center was actually very quiet with few residents using the facilities. The more the realtor told me how great it was to live there, the more I realized that I wasn’t a good match for that community. It was a long process of self-discovery. And who knows — with a different realtor, I may even have bought a home that weekend. It might even have worked out great. Bottom line — enjoy the research but be prepared to surprise yourself frequenty along the way. Kate were you at Sun City? Yes, it was Sun City Hilton Head. I know that thousands of people absolutely love living there. I was certainly excited about my decision too, before I had my AH-Hah moment of self-discovery. The realtor did a great job, and many people would have loved all of the friendly information she provided. In my case, I realized that (1) I was too much of an introvert to enjoy that kind of community, and (2) I would probably be more comfortable in an all-age community. I ended up ignoring all my years of research, and ultimately retired near family after my kids started putting down roots in the same city. It has turned out great so far, even though this location wasn’t on my spreadsheet. You know what they say…tell God your plans, and wait for her to laugh at you. I have thought about living in a mobile home community but have soured on that idea. My friend lives in one and her lot rent goes up every year. She is close to $600 a month. There is a pool but she doesn’t use it and a community building she doesn’t use. Her lot is a postage stamp size and she is close to all her neighbors, good and bad. Sometimes there are herds of kids ramming the streets. My biggest issue is her lot rent which is more than my house taxes on my paid off house. If you buy a used one be prepared for constant problems. My friend has put on a new roof. She has had leaking pipes, frozen pipes, skirting flies off during storms. She had a bad leak which ruined her kitchen floor. Luckily her homeowners insurance paid because it was a big job to replace the flooring and sub floor. She replaced her ac too. Water leaks are bad too because water is metered and you pay for it whether you use it inside or your pipes are leaking on the ground. Well…we’re choosing a mobile home community where you own the land and HOA is only $122 per mo including cable….or a condo. The mobile home is less expensive and has a large lot with many activities but with a condo you have to worry about assessments. I’d prefer a larger home but a condo is better for future resale values. Fyi, this is in riverside county of soutgern CA too…. By folding nursing homes and assisted living facilities together in your description you neglected to mention a key difference between them. Nursing homes are highly regulated and the residents protected. In assisted living, the requirements for everything vary widely by state. The home is your landlord more than your caretaker. My mother resided in an assisted living facility. It was beautiful, the staff were wonderful, and she was very happy there. Shortly after she left to go to the hospital, the owner decided to convert it into condos. The owner is alleged to have evicted residents, refused services, and generally made the residents’ lives miserable to force them to move out. There were lawsuits but apparently the new owner had the legal right to decide to change from being an assisted living facility to a regular luxury condo building. They didn’t even need to move residents into a new facility. I hate nursing homes, but none of that could have happened in one. Bottom line, be very sure what the legal requirements and protections are for assisted living facilities in your state, or at least have a backup plan, before you trust yourself to one. A question about CCRCs; what happens if more people in the independent living area need to move to assisted living or nursing home facilities than the community has beds in those sections? The skeptic in me sees a parallel between the CCRCs and Long Term Care insurance, both great ideas but the LTC ins companies have had trouble projecting the future costs they will incur and so the premiums has skyrocketed for those who bought policies in the past and some of the companies no longer even offer it. Interested in CCRCs in Tennessee or Alabama. Anyone have experience or could recommend facilities in those areas? Want to be on a campus situation should health fail but still convenient for spouse who may not need more care. Found that my parents had transportation difficulty getting to see each other when father was in rehab. They had to depend on us kids. We have no children. Thanx for any information. We are looking to retire in Mississippi or Alabama due to cost of living being low. 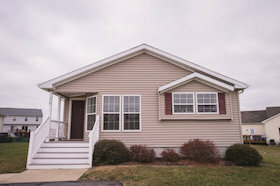 We will be purchasing a manufactured home and want an active adult community but can’t seem to find any. We also are concerned about health issues. How can I get a list of adult communities in these states? Regarding Jean’s question: CCRCs are regulated in the respective states and are supposed to meet some requirements to be able to meet future demands. That is no guarantee. It is always good to look at the financials of anyplace you retire to assure yourself they can weather a storm. Also, you can use Advanced Search to find manufactured homes mentioned by State. We did our assignment as suggested at the end of this article and after 38 years of marriage knew we both had similar ideas and know the “where”, but my wife thinks a 55+ active adult community would be fun for several years, however I think that means another move down the line and neither of us want a CCRC at 65. I don’t think today’s 55+ communities are ones where neighbors take care of neighbors the retirees have probably taken care of parents and kids and are not about to take on caring for aging neighbors. But I’m thinking maybe a 55+ community keeps you young and then when needed have home health aides come in so you can age in place and yet another move not necessary. Dennis, why limit yourself to a 55+ community? It will also age out. Why not just buy in a nice mixed age community and then have the home health aides come in when or if needed? By the way, not all older people lose their memory, or are infirm in any way, we only hear about the ones that are. I am suspicious of isolating myself in any limited age group community and I think it is a mistake for many people. Younger people will keep you young–older ones will only be thinking of their aches and pains. I am a former nurse and have seen it all. We have a communities of virtual villages her in Washington, DC where for $600/per year you can become a member. As such, you can call and get a volunteer to take you to doctors appointments, shopping, etc. Vendors such as painters and electricians (just to name two of many) are rated by the members within their village. Events and trips are planned–it has been a godsend and allows people to age in place. Common sense about choosing a one level dwelling and getting rid of throw rugs to prevent falls are also common sense tips. Age does not always equal illness as we keep hearing. Being around all age groups is a big help towards good social interactions. I agree with Jennifer. I am mid 70’s but still think like I am 40 or 50. I have visited 55+ communities but find I have nothing in common with them. Am still in my own home and loving it. Q: Can you recommend a consultant or a specialist I can confer with regarding active retirement communities? A: We really don’t know of a consultant to help with this. You could try our Retirement Ranger and/or Advanced Search to try to narrow down the possibilities. Barbara: Thoughts on 55+ communities vs all age communities? Jean: Barbara, regarding 55+ vs All Age communities – it depends (although after never wanting to live in a 55+ community I have become a convert and am in the process of buying in one). 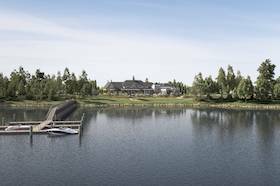 Some things to consider – if you are planning on building in a new community you might find that the models offered in ALL Age communities are way too big so would be better in a 55+. Also, if you are going to buy a townhouse, 55+ might be a better choice. We are currently renting a townhouse in an All Age community (with lots of seniors in it) but our neighbors are a young couple with young children who we hear through the walls. Not voices but balls bouncing, music lesson practice, etc. We dont complain but wouldn’t want to be here permanently.